Featuring polished silver-tone surfaces and a practical design, this stemware rack offers an elegant storage solution for any kitchen. 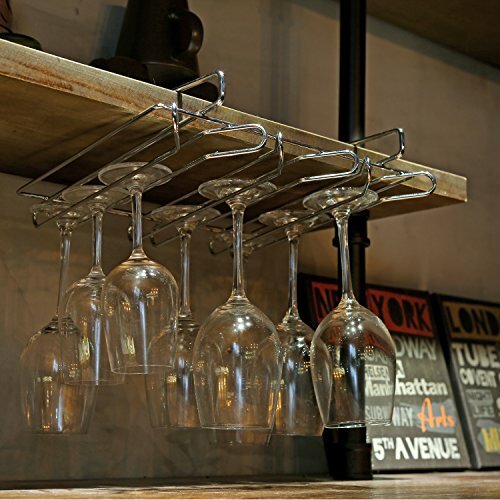 The rack can easily be attached under shelves or cabinets and keep up to a dozen wine glasses safely secured. Simply slide the support rails attached to the rack over the top of a table or shelf, and the stemware holder will hang underneath providing space efficient storage (attachment surface must be less than .75 inches thick). Whether utilized in a winery, bar, or your own home, this stemware holder will provide modern style and useful storage space. Approximate Dimensions (in inches): 15 W X 12.75 L X 2.5 H.
A modern space-saving wine glass rack ideal for use in bars, wineries, or in your own home. Can keep up to 9 wine glasses safely secured. This stemware storage rack can be installed under cabinets by the attached support rails (attachment board can up to 0.75 inches thick).